On yesterday’s show, we spoke a bit about a new show on the VEGAS VIDEO NETWORK. Talktails with Chris Phillips (known as Zowie Bowie to tens-of-thousands of Las Vegas locals and visitors alike) will be THE show for those who want a behind-the-scenes look at the Las Vegas entertainment business. 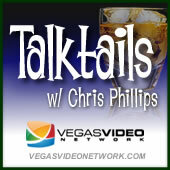 Here’s the press release: VEGAS VIDEO NETWORK Launches New Show ‘Talktails with Chris Phillips’. Please take a moment to check it out.